is Professor of Ecology and Evolution at the University of Connecticut and Vice-President of the Evolution Institute. He wrote War and Peace and War: the Rise and Fall of Empires. Today, the top one per cent of incomes in the United States accounts for one fifth of US earnings. The top one per cent of fortunes holds two-fifths of the total wealth. Just one rich family, the six heirs of the brothers Sam and James Walton, founders of Walmart, are worth more than the bottom 40 per cent of the American population combined ($115 billion in 2012). After thousands of scholarly and popular articles on the topic, one might think we would have a pretty good idea why the richest people in the US are pulling away from the rest. But it seems we don’t. As the Congressional Budget Office concluded in 2011: ‘the precise reasons for the rapid growth in income at the top are not well understood’. Some commentators point to economic factors, some to politics, and others again to culture. Yet obviously enough, all these factors must interact in complex ways. What is slightly less obvious is how a very long historical perspective can help us to see the whole mechanism. In his book Wealth and Democracy (2002), Kevin Phillips came up with a useful way of thinking about the changing patterns of wealth inequality in the US. He looked at the net wealth of the nation’s median household and compared it with the size of the largest fortune in the US. The ratio of the two figures provided a rough measure of wealth inequality, and that’s what he tracked, touching down every decade or so from the turn of the 19th century all the way to the present. In doing so, he found a striking pattern. From 1800 to the 1920s, inequality increased more than a hundredfold. Then came the reversal: from the 1920s to 1980, it shrank back to levels not seen since the mid-19th century. Over that time, the top fortunes hardly grew (from one to two billion dollars; a decline in real terms). Yet the wealth of a typical family increased by a multiple of 40. From 1980 to the present, the wealth gap has been on another steep, if erratic, rise. Commentators have called the period from 1920s to 1970s the ‘great compression’. The past 30 years are known as the ‘great divergence’. Bring the 19th century into the picture, however, and one sees not isolated movements so much as a rhythm. In other words, when looked at over a long period, the development of wealth inequality in the US appears to be cyclical. And if it’s cyclical, we can predict what happens next. An obvious objection presents itself at this point. Does observing just one and a half cycles really show that there is a regular pattern in the dynamics of inequality? No, by itself it doesn’t. But this is where looking at other historical societies becomes interesting. In our book Secular Cycles (2009), Sergey Nefedov and I applied the Phillips approach to England, France and Russia throughout both the medieval and early modern periods, and also to ancient Rome. All of these societies (and others for which information was patchier) went through recurring ‘secular’ cycles, which is to say, very long ones. Over periods of two to three centuries, we found repeated back-and-forth swings in demographic, economic, social, and political structures. And the cycles of inequality were an integral part of the overall motion. Incidentally, when students of dynamical systems (or, more colourfully, ‘chaoticians’ such as Jeff Goldblum’s character in the film Jurassic Park) talk about ‘cycles’, we do not mean rigid, mechanical, clock-like movements. Cycles in the real world are chaotic, because complex systems such as human societies have many parts that are constantly moving and influencing each other. Despite this complexity, our historical research on Rome, England, France, Russia and now the US shows that these complex interactions add up to a general rhythm. Upward trends in variables (for example, economic inequality) alternate with downward trends. And most importantly, the ways in which other parts of the system move can tell us why certain trends periodically reverse themselves. Understanding (and perhaps even forecasting) such trend-reversals is at the core of the new discipline of cliodynamics, which looks at history through the lens of mathematical modelling. So it looks like the pattern that we see in the US is real. Ours is, of course, a very different society from ancient Rome or medieval England. It is cut off from them by the Industrial Revolution and by innumerable advances in technology since then. Even so, a historically based model might shed light on what has been happening in the US over the past three decades. First, we need to think about jobs. Unless other forces intervene, an overabundance of labour will tend to drive down its price, which naturally means that workers and their families have less to live on. One of the most important forces affecting the labour supply in the US has been immigration, and it turns out that immigration, as measured by the proportion of the population who were born abroad, has changed in a cyclical manner just like inequality. In fact, the periods of high immigration coincided with the periods of stagnating wages. The Great Compression, meanwhile, unfolded under a low-immigration regime. This tallies with work by the Harvard economist George Borjas, who argues that immigration plays an important role in depressing wages, especially for those unskilled workers who compete most directly with new arrivals. This connection between the oversupply of labour and plummeting living standards for the poor is one of the more robust generalisations in history. Consider the case of medieval England. The population of England doubled between 1150 and 1300. There was little possibility of overseas emigration, so the ‘surplus’ peasants flocked to the cities, causing the population of London to balloon from 20,000 to 80,000. Too many hungry mouths and too many idle hands resulted in a fourfold increase in food prices and a halving of real wages. Then, when a series of horrible epidemics, starting with the Black Death of 1348, carried away more than half of the population, the same dynamic ran in reverse. The catastrophe, paradoxically, introduced a Golden Age for common people. Real wages tripled and living standards went up, both quantitatively and qualitatively. Common people relied less on bread, gorging themselves instead on meat, fish, and dairy products. Much the same pattern can be seen during the secular cycle of the Roman Principate. The population of the Roman Empire grew rapidly during the first two centuries up to 165AD. Then came a series of deadly epidemics, known as the Antonine Plague. In Roman Egypt, for which we have contemporary data thanks to preserved papyri, real wages first fell (when the population increased) and then regained ground (when the population collapsed). We also know that many grain fields were converted to orchards and vineyards following the plagues. The implication is that the standard of life for common people improved — they ate less bread, more fruit, and drank wine. The gap between common people and the elites shrank. Naturally, the conditions affecting the labour supply were different in the second half of the 20th century in the US. An important new element was globalisation, which allows corporations to move jobs to poorer countries (with that ‘giant sucking sound’, as Ross Perot put it during his 1992 presidential campaign). But none of this alters the fact that an oversupply of labour tends to depress wages for the poorer section of the population. And just as in Roman Egypt, the poor in the US today eat more energy-dense foods — bread, pasta, and potatoes — while the wealthy eat more fruit and drink wine. Falling wages isn’t the only reason why labour oversupply leads to inequality. As the slice of the economic pie going to employees diminishes, the share going to employers goes up. Periods of rapid growth for top fortunes are commonly associated with stagnating incomes for the majority. Equally, when worker incomes grew in the Great Compression, top fortunes actually declined in real terms. The tug of war between the top and typical incomes doesn’t have to be a zero-sum game, but in practice it often is. And so in 13th-century England, as the overall population doubles, we find landowners charging peasants higher rents and paying less in wages: the immiseration of the general populace translates into a Golden Age for the aristocrats. As the historian Christopher Dyer wrote, life was good for the upper-crust English around 1300. They drank more wine and spent their spare cash building or refurbishing castles, cathedrals, and monasteries. They didn’t just enjoy a better living standard; they also grew in number. For example, the number of knights and esquires tripled between 1200 and 1300. But disaster struck in 1348, when the Black Death removed the population surplus (and then some). By the 15th century, while the common people were enjoying their own Golden Age, the aristocracy had fallen on hard times. We can infer the severity of their financial straits from the amount of claret imported from France. Only the gentry drank wine, and around 1300, England imported 20,000 tuns or casks of it from France per year. By 1460, this declined to only 5,000. In the mid-15th century, there were simply fewer aristocrats and they were much poorer. In the US between around 1870 and 1900, there was another Golden Age for the elites, appropriately called the Gilded Age. While living standards for the majority declined (seen vividly in dwindling average heights and life expectancies), the moneyed classes were enjoying ever more luxurious lifestyles. And just like in 13th-century England, the total number of the wealthy was shooting up. Between 1825 and 1900, the number of millionaires (in constant 1900 dollars) went from 2.5 per million of the population to 19 per million. In our current cycle, the proportion of decamillionaires (those whose net worth exceeds 10 million in 1995 dollars) grew tenfold between 1992 and 2007 — from 0.04 to 0.4 per cent of the US population. This seems like a peculiar development. The reason for it — cheeringly enough, you might say — is that cheap labour allows many enterprising, hard-working or simply lucky members of the poorer classes to climb into the ranks of the wealthy. In the 19th century, a skilled artisan in the US could expand his workshop by hiring other workers, eventually becoming the owner of a large business; Sven Beckert’s The Monied Metropolis (2003) describes many instances of this story playing out. In America today, enterprising and hard-working individuals start dotcom companies or claw their way into jobs as the CEOs of large corporations. On the face of it, this is a wonderful testament to merit-based upward mobility. But there are side effects. Don’t forget that most people are stuck with stagnant or falling real wages. Upward mobility for a few hollows out the middle class and causes the social pyramid to become top-heavy. Too many elites relative to the general population (a condition I call ‘elite overproduction’) leads to ever-stiffer rivalry in the upper echelons. And then you get trouble. In the US, there is famously a close connection between wealth and power. Many well-off individuals — typically not the founders of great fortunes but their children and grandchildren — choose to enter politics (Mitt Romney is a convenient example, though the Kennedy clan also comes to mind). Yet the number of political offices is fixed: there are only so many senators and representatives at the federal and state levels, and only one US president. As the ranks of the wealthy swell, so too do the numbers of wealthy aspirants for the finite supply of political positions. When watching political battles in today’s Senate, it is hard not to think about their parallels in Republican Rome. The population of Italy roughly doubled during the second century BC, while the number of aristocrats increased even more. Again, the supply of political offices was fixed — there were 300 places in the senate and membership was for life. By the end of the century, competition for influence had turned ugly. During the Gracchan period (139—110BC), political feuding led to the slaughter of the tribunes Tiberius and Gaius on the streets of Rome. During the next century, intra-elite conflict spilt out of Rome into Italy and then into the broader Mediterranean. The civil wars of the first century BC, fuelled by a surplus of politically ambitious aristocrats, ultimately caused the fall of the Republic and the establishment of the Empire. Beside sheer numbers, there is a further, subtler factor that aggravates internal class rivalry. So far I have been talking about the elites as if they are all the same. But they aren’t: the differences within the wealthiest one per cent are almost as stark as the difference between the top one per cent and the remaining 99. The millionaires want to reach the level of decamillionaires, who strive to match the centimillionaires, who are trying to keep up with billionaires. The result is very intense status rivalry, expressed through conspicuous consumption. Towards the end of the Republic, Roman aristocrats competed by exhibiting works of art and massive silver decorations in their homes. They threw extravagant banquets with peacocks from Samos, oysters from Lake Lucrino and snails from Africa, all imported at great expense. Archaeology confirms a genuine and dramatic shift towards luxury. Intra-elite competition also seems to affect the social mood. Norms of competition and extreme individualism become prevalent and norms of co-operation and collective action recede. Social Darwinism took off during the original Gilded Age, and Ayn Rand (who argued that altruism is evil) has grown astonishingly popular during what we might call our Second Gilded Age. The glorification of competition and individual success in itself becomes a driver of economic inequality. As Christopher Hayes wrote in Twilight of the Elites (2012): ‘defenders of the status quo invoke a kind of neo-Calvinist logic by saying that those at the top, by virtue of their placement there, must be the most deserving’. By the same reasoning, those at the bottom are not deserving. As such social norms spread, it becomes increasingly easy for CEOs to justify giving themselves huge bonuses while cutting the wages of workers. Such cultural attitudes work with economic forces to widen inequality. Economists know very well that few markets are ‘efficient’ in the sense that their prices are set entirely by the forces of supply and demand. Labour markets are especially sensitive to cultural norms about what is fair compensation, so prevailing theories about inequality have practical consequences. And labour markets are also strongly affected by government regulation, as the economist and Nobel laureate Joseph Stiglitz has argued. So let’s consider how politics enters the equation here. The US, as we saw, breeds strong links between wealth and politics. Some wealthy individuals run for office themselves. Others use their money to support their favoured politicians and policies. As a result, the US political system is much more attuned to the wishes of the rich than to the aspirations of the poor. Kevin Phillips has been one of the most influential voices raised in alarm at the dangers for democracy of growing wealth disparity. 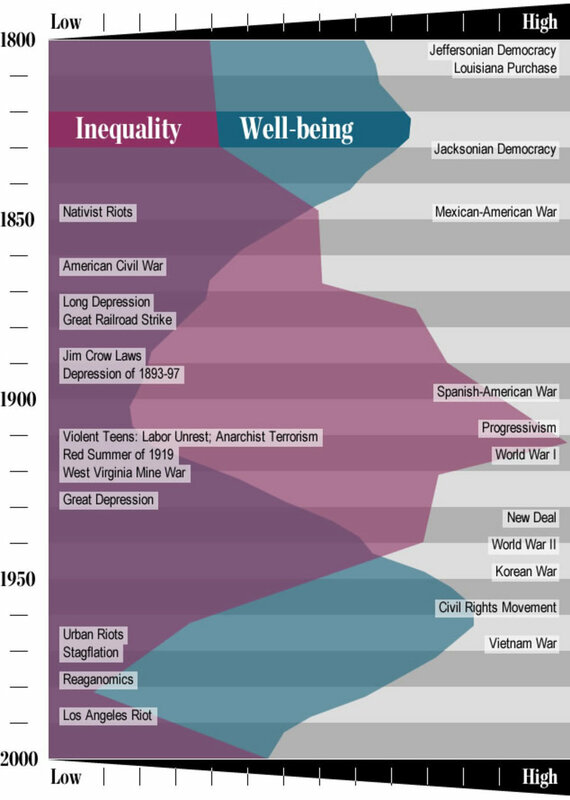 Inverse relationship between well-being and inequality in American history. The peaks and valleys of inequality (in purple) represent the ratio of the largest fortunes to the median wealth of households (the Phillips curve). The blue-shaded curve combines four measures of well-being: economic (the fraction of economic growth that is paid to workers as wages), health (life expectancy and the average height of native-born population), and social optimism (the average age of first marriage, with early marriages indicating social optimism and delayed marriages indicating social pessimism). Yet the US political system has been under the influence of wealthy elites ever since the American Revolution. In some historical periods it worked primarily for the benefit of the wealthy. In others, it pursued policies that benefited the society as a whole. Take the minimum wage, which grew during the Great Compression era and declined (in real terms) after 1980. The proportion of American workers who were unionised changed in a similarly cyclical fashion, as the legislative field tilted first one way then the other. The top marginal tax rate was 68 per cent or higher before 1980; by 1988 it declined to 28 per cent. In one era, government policy systematically favoured the majority, while in another it favoured the narrow interests of the wealthy elites. This inconsistency calls for explanation. It is relatively easy to understand the periods when the wealthy bent the agenda to suit their interests (though of course, not all rich people care exclusively about their own wealth). How, though, can we account for the much more broadly inclusive policies of the Great Compression era? And what caused the reversal that ended the Gilded Age and ushered in the Great Compression? Or the second switch, which took place around 1980? History provides another clue. Unequal societies generally turn a corner once they have passed through a long spell of political instability. Governing elites tire of incessant violence and disorder. They realise that they need to suppress their internal rivalries, and switch to a more co-operative way of governing, if they are to have any hope of preserving the social order. We see this shift in the social mood repeatedly throughout history — towards the end of the Roman civil wars (first century BC), following the English Wars of the Roses (1455-85), and after the Fronde (1648-53), the final great outbreak of violence that had been convulsing France since the Wars of Religion began in the late 16th century. Put simply, it is fear of revolution that restores equality. And my analysis of US history in a forthcoming book suggests that this is precisely what happened in the US around 1920. These were the years of extreme insecurity. There were race riots (the ‘Red Summer of 1919’), worker insurrections, and an Italian anarchist terrorist campaign aimed directly at the elites. The worst incident in US labour history was the West Virginia Mine War of 1920—21, culminating in the Battle of Blair Mountain. Although it started as a workers’ dispute, the Mine War eventually turned into the largest armed insurrection that the US has ever seen, the Civil War excepted. Between 10,000 and 15,000 miners armed with rifles battled against thousands of strikebreakers and sheriff deputies. The federal government eventually called in the US Army, the only time it has ever done so against its own people. Add to all this the rise of the Soviet Union and the wave of socialist revolutions that swept Europe after the First World War, triggering the Red Scare of 1921, and you get a sense of the atmosphere. Quantitative data indicate that this period was the most violent in US history, second only to the Civil War. It was much, much worse than the 1960s. The US, in short, was in a revolutionary situation, and many among the political and business elites realised it. They began to push through a remarkable series of reforms. In 1921 and 1924, Congress passed legislation that effectively shut down immigration into the US. Although much of the motivation behind these laws was to exclude ‘dangerous aliens’ such as Italian anarchists and Eastern European socialists, the broader effect was to reduce the labour surplus. Worker wages grew rapidly. At around the same time, federal income tax came in and the rate at which top incomes were taxed began to increase. Somewhat later, provoked by the Great Depression, other laws legalised collective bargaining through unions, introduced a minimum wage, and established Social Security. The US elites entered into an unwritten compact with the working classes. This implicit contract included the promise that the fruits of economic growth would be distributed more equitably among both workers and owners. In return, the fundamentals of the political-economic system would not be challenged (no revolution). The deal allowed the lower and upper classes to co-operate in solving the challenges facing the American Republic — overcoming the Great Depression, winning the Second World War, and countering the Soviet threat during the Cold War. It almost goes without saying that there was a racist and xenophobic underside to all this. The co-operating group was mainly native-born white Protestants. African-Americans, Jews, Catholics and foreigners were excluded or heavily discriminated against. Nevertheless, while making such ‘categorical inequalities’ worse, the compact led to a dramatic reduction in overall economic inequality. Many managers and stockholders [made] peace with the liberal order that had emerged. They began to bargain regularly with the labour unions at their companies. They advocated the use of fiscal policy and government action to help the nation to cope with economic downturns. They accepted the idea that the state might have some role to play in guiding economic life. When Barry Goldwater campaigned on a pro-business, anti-union and anti-big government platform in the 1964 presidential elections, he couldn’t win any lasting support from the corporate community. The conservatives had to wait another 16 years for their triumph. But by the late 1970s, a new generation of political and business leaders had come to power. To them the revolutionary situation of 1919-21 was just history. In this they were similar to the French aristocrats on the eve of the French Revolution, who did not see that their actions could bring down the Ancien Régime — the last great social breakdown, the Fronde, being so far in the past. The US elites, similarly, took the smooth functioning of the political-economic system for granted. The only problem, as they saw it, was that they weren’t being adequately compensated for their efforts. Feelings of dissatisfaction ran high during the Bear Market of 1973—82, when capital returns took a particular beating. The high inflation of that decade ate into inherited wealth. A fortune of $2 billion in 1982 was a third smaller, when expressed in inflation-adjusted dollars, than $1 billion in 1962, and only a sixth of $1 billion in 1912. All these factors contributed to the reversal of the late 1970s. It is no coincidence that the life of Communism (from the October Revolution in Russia in 1917 to the fall of the Berlin Wall in 1989) coincides almost perfectly with the Great Compression era. The Red Scares of, firstly, 1919—21 and then 1947—57 suggest that US elites took the Soviet threat quite seriously. More generally, the Soviet Union, especially in its early years, aggressively promoted an ideology that was highly threatening to the political-economic system favoured by the US elites. Reforms that ensured an equitable distribution of the fruits of economic growth turned out to be a highly effective counter to the lure of Bolshevism. Nevertheless, when Communism collapsed, its significance was seriously misread. It’s true that the Soviet economy could not compete with a system based on free markets plus policies and norms that promoted equity. Yet the fall of the Soviet Union was interpreted as a vindication of free markets, period. The triumphalist, heady atmosphere of the 1990s was highly conducive to the spread of Ayn Randism and other individualist ideologies. The unwritten social contract that had emerged during the New Deal and braved the challenges of the Second World War had faded from memory. What, then, explains the rapid growth of top fortunes in the US over the past 30 years? Why did the wages of unskilled workers stagnate or decline? What accounts for the bitterness of election rhetoric in the US, the growing legislative gridlock, the rampant political polarisation? My answer is that all of these trends are part of a complex and interlocking system. I don’t just mean that everything affects everything else; that would be vacuous. Rather, that cliodynamic theory can tell us specifically how demographic, economic and cultural variables relate to one another, and how their interactions generate social change. Cliodynamics also explains why historical reversals in such diverse areas as economics and culture happen at roughly similar times. The theory of secular cycles was developed using data from historical societies, but it looks like it can provide answers to questions about our own society. Three years ago I published a short article in the science journal Nature. I pointed out that several leading indicators of political instability look set to peak around 2020. In other words, we are rapidly approaching a historical cusp, at which the US will be particularly vulnerable to violent upheaval. This prediction is not a ‘prophecy’. I don’t believe that disaster is pre-ordained, no matter what we do. On the contrary, if we understand the causes, we have a chance to prevent it from happening. But the first thing we will have to do is reverse the trend of ever-growing inequality. Correction, Feb 13, 2013: When first published, this article misidentified Michael Bloomberg, the mayor of New York City, as an inheritor of a large fortune. In fact he amassed most of his wealth himself.